Upon recommendation from a trusted food-loving friend, we made it a point to stick Oven & Shaker on our itinerary for Portland eating. 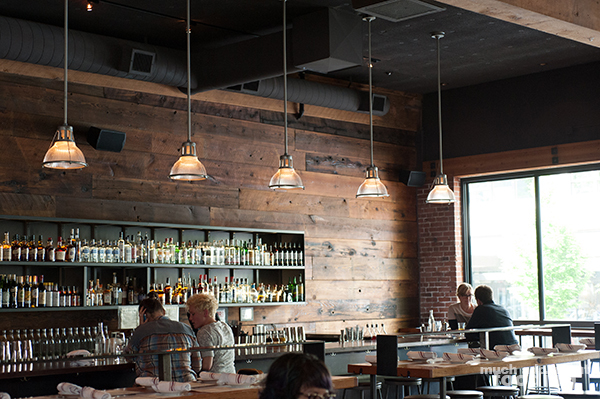 It is located in a quaint district full of plenty of other food options. How would one choose where to eat if not for the prolific amount of internet sources these days? If we didn't have Yelp, Urbanspoon, Trip Advisor, and the other multitude of crowdsourcing reference, we wouldn't know which spot to stop into. Luckily, Oven & Shaker did give off a vibe that made me curious to explore it regardless of whether or not it was already on our list. We had planned to arrive there during Happy Hour when prices were fair but tried very little since were still full. 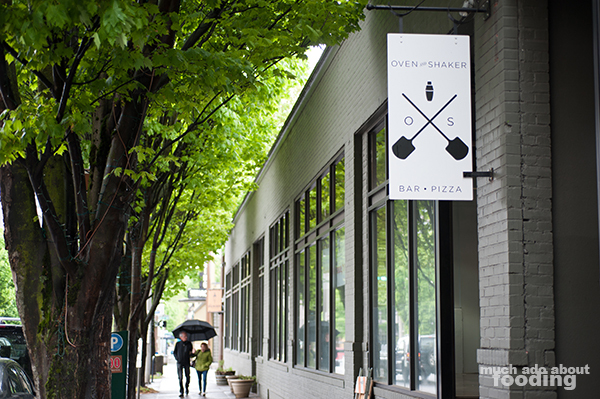 The restaurant itself is called Oven & Shaker because the main focuses are pizzas and cocktails. It's a cute name and quite the apt one considering their menu. 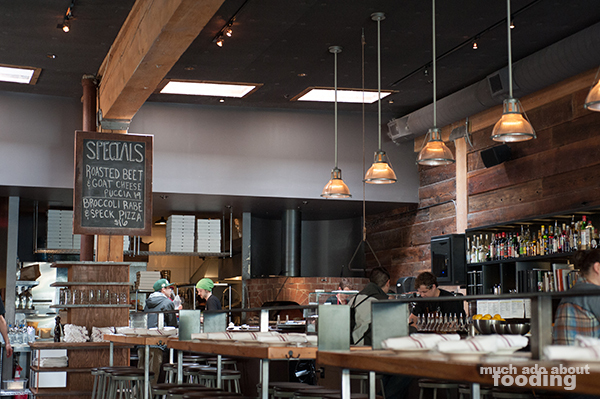 Inside was a brick pizza oven, wood paneling, and a palette of earthy and gray hues. An impressive full wall behind the bar housed more than enough spirits to make you a happy camper, and a nearly as extensive bar seating area allowed for much imbibing. We opted not to splurge on the cocktails (which were a bit hefty in price) though they did sound good and looked instead on their Happy Hour menu. The specials run during these particular hours were nearly too good to pass up. 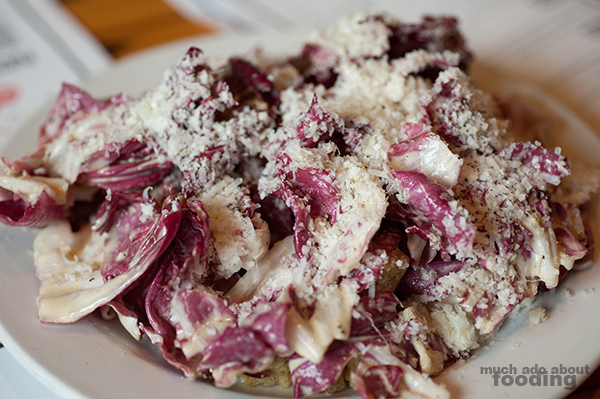 I still think about the salad we ordered which was the Nostrana ($6HH - radicchio, parmigiano, rosemary-sage croutons, and Cæsar style dressing). Why? First of all, it looks smothered in cheese and dressing which I don't typically like but both components were quite light on the stomach. The bitterness from the radicchio played well with the dressing, and the croutons were minute while still lending the necessary crunch (aside from the vegetables' crunch) to the meal. Also, since it was radicchio, there was little chance of the salad getting soggy before I finished it. Other starters one could grab are items like fried chickpeas, a cheese plate, a salumi plate, and even arancini. So why not the rave reviews here? 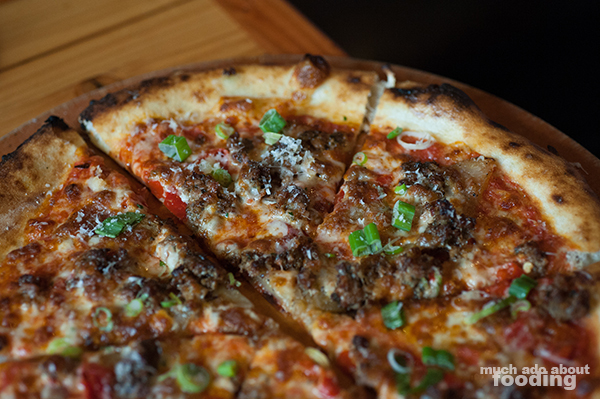 Well, we ended up also getting a pizza which only made sense - ours was the Wild Fennel Sausage Pizza ($10HH - potato, tomato, chilies, scallions, and smoked mozzarella). The pizza had fantastic toppings and the dough of the crust was great; however, the technique of making and then serving this pizza did not give a satisfactory experience. The pizza was somehow quite soggy towards the middle yet still burnt/charred on the edges. It was also colder than we expected since we had waited a while for this pie to come out. I did love the ingredients though, and the potato was a nice underlying touch. If you want other pizzas, the options are vast including varieties like octopus, pork belly, bianca, margherita and salami. You could also add more toppings like prosciutto ($5), duck egg ($3), bufala mozzerella ($4), ghost chili salami ($5), and more if you like! The space was great, and I could see it a place where a big group of people would work out well. I would definitely give this place a few more shots whenever I'm back in Portland just to make sure that our visit wasn't a fluke. After all, we only tried two dishes so take this review with as much severity as you can muster. At the very least, you can get a cocktail which I hear are extremely balanced and well-made.